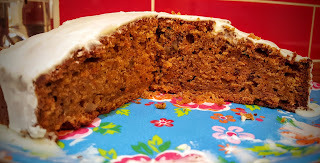 Photobrook Photography: Wet weather weekends are the perfect reason to stay indoors and bake! Wet weather weekends are the perfect reason to stay indoors and bake! With the weather turning wet, windy and wild over the weekend it's time to stay indoors in the warm and put my baking hat back on. 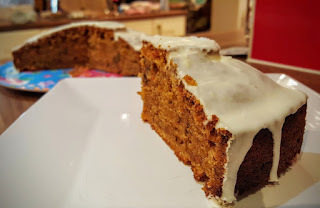 With a whole weekend to myself I decided to make not one but two bakes this weekend starting with a gorgeous carrot and walnut cake with cream cheese frosting. Followed by a rustic scotch egg pie. Having a peek in the fridge on a soggy Saturday morning I noticed the sheer amount of carrots lurking in the salad draw and thought to myself what a great excuse to make a delicious carrot cake. 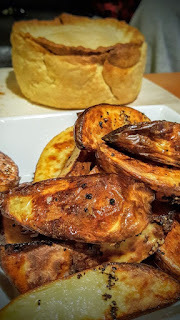 I trawled through my recipe books at home and couldn't find a recipe that I liked and headed off onto the Internet to stumble across this recipe by Paul Hollywood. Looking in the cupboards and not wanting to go out in the rain I amended the recipe slightly to feature walnuts instead of pecan nuts and I had to miss out the mixed spice as this was missing from the spice rack, however I did increase the Cinnamon and ginger slightly to make up for this missing ingredient. 01. Preheat the oven to 180°C/fan160°C/gas 4. Grease an 18cm loose-bottomed round cake tin and line the base with baking paper. Sift the flour, baking powder and spices into a large bowl. Add the sugar, zest, pecans and grated carrots, then stir until well combined. Stir in the beaten eggs and oil, then mix well. 02. Pour into the prepared cake tin and bake in the oven for 1 hour or until a skewer comes out clean. Transfer to a cooling rack, leave in the tin for 5 minutes, then turn out and leave to cool completely before icing. 03. For the icing, beat the butter in a large bowl with a hand mixer until really soft. Add the cream cheese and beat again until well mixed. Sift over the icing sugar, add the orange juice, then beat until smooth. Store, covered, in the fridge until needed. 04. To decorate, fill a piping bag fitted with a plain, small nozzle with icing, then carefully pipe lines across the top of the cake. Give the cake a quarter of a turn and pipe more lines across. Dust with a little icing sugar and scatter some grated satsuma/mandarin zest on the top. I've got to say the bake went beautifully, an easy recipe to follow and a great cake and once cooled I moved onto creating the cream cheese frosting. Sadly this is where mt cake was a little bit of a let down. I had bought a healthy living version of cream cheese rather than full fat and it was seriously watery. I tried to make up the icing the best I could but the liquid icing was impossible to thicken up. Even half a box of icing sugar later couldn't help! A light drizzle of the icing was used on top of the cake and it tasted delicious even if there was a lot of wasted icing and it wasn't quite like the picture. Moral of the story, don't be healthy when baking! Always use full fat cream cheese when it tells you to. Hopefully the judges on the Great Denby Bake off aren't as strict as Paul Hollywood and will give me credit for my resourcefulness and adaptation of the recipe. Whilst that cake was cooling it was time to make me a pie! This weekend I was joined at home by my poorly partner with a snuffly flu type cough and cold. What better way to make your loved one feel better than with home made pie. 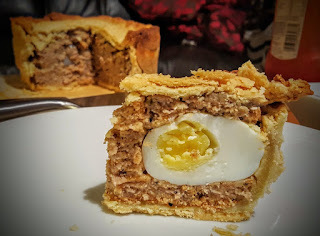 Again heading straight to the Internet I found a recipe for a scotch egg pie from the BBC and this time I altered the recipe slightly to feed just the two of us. 01. Put 6 of the eggs in a large pan of cold water. Bring to the boil, then remove from the heat. Leave for 5 mins, then lift out eggs and cool under cold running water. Peel. 02. Snip the ends of the sausages and squeeze the meat out into a mixing bowl. Add the mace, thyme, 75g of the breadcrumbs, 1 remaining egg and some ground pepper, and mix together well – you’ll probably need to get your hands in. 03. Heat oven to 200C/180C fan/gas 6. Criss-cross 2 long strips of baking parchment in a 20cm pie tin or round cake tin (to help you lift out the pie). Roll out half the pastry on a lightly floured surface to line the tin. Scatter remaining breadcrumbs over the base of the pastry, then pat in about a quarter of the sausage mixture. Evenly space the peeled eggs on top, then gently pack the meat around and over – trying to evenly cover the eggs without leaving any gaps. 04. Roll out remaining pastry, cover the pie, then trim the edges. Pinch and crimp edges to seal, poke a steam hole in the top, then glaze with the final egg, lightly beaten with a fork. Scatter with the sesame seeds, then bake for 30 mins. 05. Remove the pie from the oven and carefully remove it from the tin. Place on a baking tray and return to the oven for 10 mins to brown the sides of the pie. Transfer to a wire rack to cool, then serve in chunky wedges. I made my own home made pastry and whilst this chilled in the fridge I moved over to hard boil some eggs and make the sausage meat mixture. Once these were done it was time to assemble the pie and bake. My only criticism on this pie is that the pastry was maybe a bit too thick and I had to bake the pie for slightly longer as sections were a little doughy. But that was my fault making too much pastry and insisting on using it all! I love to be a bit naughty and love pastry so the thick delicious pastry wasn't a problem but next time I will use slightly less and save my waistline the trauma of eating additional pie pastry! All in all both recipes were great, both easy to follow and easily adjusted to what I had in the cupboard and avoiding any trips to the local shops in the gale force winds and sideways rain. I will definitely make both items again and the best bit of news, the pie and cake made my poorly boy feel better.